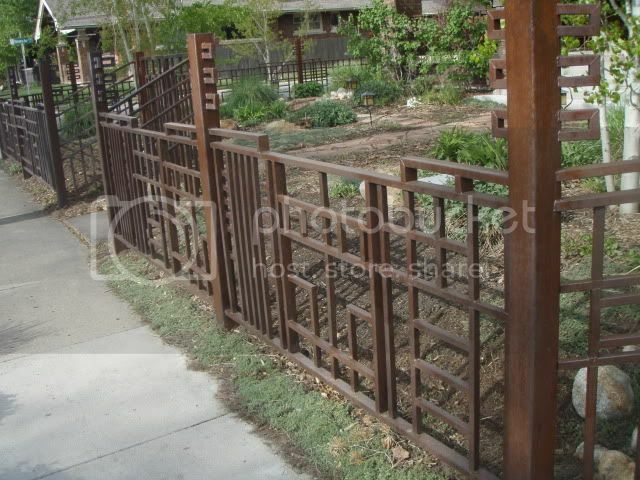 Looking for input on how to get a particular red/brown/light rust finish on a fence project. I talked to a guy at a local art fair who had a similar finish and he said he used an 'acid bath' to get an even, light rusting. I've tried leaving test pieces out in the rain & sprayed salt water on them but the rust ends up blotchy and looks like its been, well, left out in the rain. This is a gong I recently finished with a brushing of Muriatic Acid to get an even finish. It will eat lots of your existing rust off, but , once hosed off well, comes back, starting in about 3 minutes, depending on local humidity. Overnight, with morning dew will have the whole thing covered, couple of days and it gets pretty solid looking. Some advise neutralizing the acid with a baking soda solution, but I never do that because its rust I am going for. That "yellow" rust gets darker and deeper with time. was originally like this...right after its acid wash. (early "character" there was abandoned). Last edited by Hotfoot; 07-08-2009, 01:02 PM. Those look great! I'm guessing that when it gets to a stage where I like the color, I can clearcoat with a rattle can and it'll stay that way? Why clearcoat?? When yo do, it'll darken it (a lot), and the clear will degrade in UV light, requiring re-spraying on a regular basis. If you want rust, let it rust. As long as its not in contact with the ground, it won't rust through in your lifetime...unless you leave voids or cracks for moisture to accumulate in. If you just want a painted finish, just mix up some Rustoleum flat or satin to the color you want. Seems to me clearcoating will be problematic. Field-applied clear finishes are not lifetime finishes. You might have success with an automotive grade clear-coat. Really toxic and expensive but might be worth it. Check with local bodyshops..they might be willing to spray your stuff e.g. if already planning to clear-coat a car. How long was it between these two photos? Weeks? Years? Probably a year or so...but consider this is South Texas, and rains are few and far between lately. I'm in Utah and the rain situation is similar -- thanks for the info!